Economic development in the modern age is based on industrial development, which is the origin of all modern progress, ultimately enhancing the standard of living and social welfare. And all industrial activities depend on good quality metals as the basic material. This makes the metal production industries the starting point and the hope of the other industries and steel is by far the most demanded of all metals. Industrial managers and planners rely greatly on good quality steel because it allows the construction of diverse production plants and final products and it also helps flourish the construction industry, and development in general. And the steel industry largely depends on the availability of raw steel which is the lifeblood of the steel rolling industry. In other words industries begin in the mills that produce raw steel: it ensures development and expansion of plants and factories. 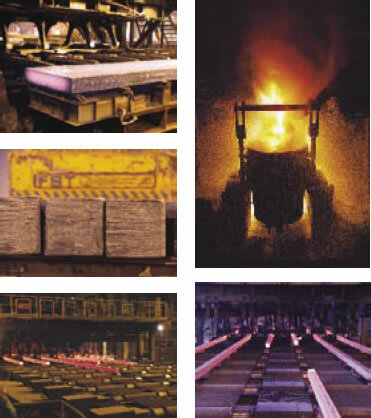 Presently Iran has two major raw steel producing centres: one in Isfahan and the other in Khuzistan, which are considered to be the bases of the domestic steel products (beams, angles, bars...) manufacturing. Iran is in fact an exporter of steel products particularly high quality slabs and blooms. Khuzistan, with its great comparative advantages, is an ideal location for the growth and flourish of this industry. According to the estimates of the Steel Industry Development Strategy, by the year 2013 Iran's consumption of steel shall increase from the present level of 11m tons to 23.5m tons a year. If we add to this figure that of 7.5m envisaged as the quantity to be exported annually by then, we reach the figure of 31m tons. 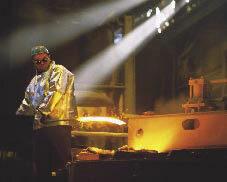 This means that in 2013 per capita steel production in this country must reach 293 kg from the present level of 120 kg. To achieve this objective Iran must increasingly consolidate its economic development strategy and its steel production plans in particular. At the same time, to be competitive in the modern world, we have to constantly lower costs and thereby prices of our goods. Here again Khouzistan offers a unique advantage as it has easy access to international waters of the Persian Gulf. This lowers international transportation costs considerably thus lowering the final cost price in the international market. At present Iran's best customers for steel are the states that lie south of the Persian Gulf and in Southeast Asia to which goods are most conveniently shipped by sea. Khouzistan is endowed with vast natural gas resources. Once the project for collection and optimization of use of natural gas in Khouzistan is completed the region will have the potential to supply 4.5m cubic meters of natural gas in addition to the present capacity, which will mean a tremendous comparative advantage to Khouzistan's steel industry. Furthermore, once pipelines 5 and 6, transferring natural gas from Assaluyeh to Khuzistan, come into operation the conditions will be far more promising than ever envisaged. In addition to these pipelines, two other gas lines will come into operation by 2005, a 24" line in the north of Khouzistan and a 35" line passing by Abadan at a distance of 20 km. The latter shall change conditions in Abadan and Khorramshahr most favorably. On the other hand, Khouzistan has the largest of Iran's rivers, notably the river Karoon, on which numerous dams have been built. These huge dams provide enormous electric power, power that is transmitted by 400 kw lines from Ahwaz to Abadan and from Omidieh to Mahshahr, not far from Abadan. Khuzistan, specially Khorramshahr and the ports on the coasts of the Persian Gulf, have proved to be the safest parts of Iran as regards earthquakes. In other words Khuzistan, and Khorramshahr in particular, offer all one wants to build a large steel industry. This is why Khouzistan Steel Complex has decided to build a large factory in the vicinity of Khorramshahr, to produce two million tons of raw steel a year.